Why do you need PPT to Flash converter? Here is the key advantages for converting a PowerPoint presentation PPT file into a Flash file SWF, FLV, FLA etc. Once your PPT files are converted to Flash, you can easily share your PPT file in any Internet browser. You can view a PowerPoint PPT file in these browser such as Mozilla, Netscape, Safari, Opera, and others.. You aren't required to install any special software or tell your audience to do the same. Everyone who has a computer including those on Macs, Linux, Solaris, HP, SGI workstations, and handheld devices (with an integrated Flash player) can watch your PowerPoint in Flash. A PowerPoint presentation converted to Flash can drastically reduce the size up to 1/10th of the original file size. Others can edit PowerPoint files if they have PowerPoint installed on their machine. This is not the case for Flash files. So flash is more secure. What is best PPT to Flash converter? PPT to Flash converter can convert your PowerPoint into Flash files SWF FLV FLA etc. It can convert PPT to swf, convert PPT to fla, convert PPT to flv. We introduce you the best PPT to Flash Converter. Wish you can enjoy yourself! PPT To Flash Studio is a powerful tool to convert and enhance Microsoft PowerPoint presentation into Flash. It produces high quality output and the deliver the most accurate conversion result. PPT To Flash Studio support Microsoft PowerPoint 2007. with PPT To Flash Studio, you can correct this using a FREE PPT To Flash Studio Editor before you convert the file into the final Flash file. PPT To Flash Studio Key Features Integration with PowerPoint Support all version of Microsoft PowerPoint up to version 2007 with a new Ribbon interface; MultimediaAdd multimedia components such as video, sound, background music, sound, and voice recording. Sound can be synchronized with the animation; Voice Syncrhonization Synchronize the presenter's voice with slides and animations for a rich viewing experience. Voice narration can play across multiple slides; Navigation ControlChoose from a list of controls. You can add company logo, author photo and customize the navigation control by turning on/off the specific button to suit your style. Besides PPT To Flash Studio also can add Quizzes to Your Presentation Quize. Add interactive quizes such as multiple choice, short answer, click action, etc. with online reporting capabilities. It import PPTX File (PowerPoint 2007 new file format); Support Microsoft 2007 SmartArt and WordArt; Support 300+ PowerPoint Animations. 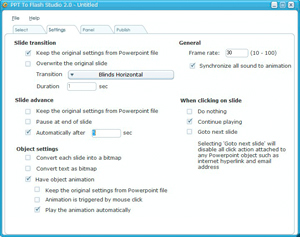 PPT To Flash Studio Download. PowerPoint to Flash Converter is a powerful PowerPoint plug-in that convert ppt to swf. It is easy to use and provides accurate, small sized, file conversions. The converted Flash file is smaller, secure, and in a streaming media format that's ideal for posting presentations to websites, intranets or for creating self-running CD-ROMs. PowerPoint to Flash Converter features: convert PowerPoint to Flash; convert ppt to swf files; Fully functional version, for personal, education and non-profit org. only; Create professional-look flash presentations and e-learning courses with PowerPoint knowledge. PowerPoint to Flash Converter retain original PowerPoint animations, slide transitions, timings, callouts, and shapes. Advanced PowerPoint to Flash solution extended with customizable Players, audio narrations recording and powerful features to tune your PowerPoint presentations. The key feature of iSpring Pro is its outstanding quality of PowerPoint to Flash conversion. The product is extensively packed with neat features that help to tune and enhance your Flash presentations. Become a Flash presentations pro with iSpring Pro. It produces quality looking Flash movies which preserve every aspect of your initial PowerPoint presentation. iSpring PowerPoint to Flash converter handles whatever you throw at your PowerPoint slides from animations and transition effects to images and videos which maintain their crisp look throughout the conversion process. All of which adds up to a Flash presentation that looks as if it were professionally created just for you. Wondershare PPT2Flash Professional is a flash-based authoring tool that enables users to develop E-learning content out of PowerPoint presentations with SCORM/AICC compliance for LMS. It is the upgrade version from the former Wondershare PPT to Flash Studio and the original Sameshow PPT to SWF converter. Wondershare PPT2Flash Professional is a flash-based authoring tool that enables users to quickly develop E-learning content out of PowerPoint presentations with SCORM/AICC compliance for LMS. The upgraded version PPT2Flash Professional 4 has included more powerful features to create content , customize output and track learning progress. Besides, this PowerPoint to FLV converter also supports converting PowerPoint to YouTube resolution file. With all original elements of animations, sounds, transitions, movie clips and internal links retained, this PowerPoint to FLV converter makes it is the best choice on converting PowerPoint to flash video for enjoyment on YouTube, Myspace, more video share sites by flash video player.